The Census Bureau estimates that just over one million people call Rhode Island “home.” While it may be the smallest state based on size in the nation, Rhode Island ranks very well when it comes to the healthiest places to live. Rhode Island moved up three spots to 10th in the 2012 “America’s Health Rankings.” A number of factors determine health insurance Rhode Island premiums. Here are some of the benefits and drawbacks associated with living in Rhode Island. Note: Stats and figures are provided by “America’s Health Rankings” from the United Health Foundation. • When it comes to immunization coverage, Rhode Island is second in the nation. 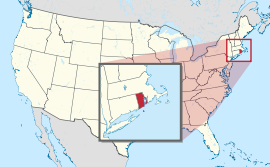 • The “Ocean State” is also second in geographic disparity. • The state is third overall when it comes to the availability of primary care physicians. • Rhode Island ranks 15th or lower in air pollution, obesity, infectious disease, public health funding, diabetes and premature death. • Binge drinking is an issue for citizens of Rhode Island as the state currently ranks 35th in the nation. • The state is 30th in High School graduation rate. • Rhode island is 36th in preventable hospitalizations. • The state is 29th in both cardiovascular deaths and cancer-related deaths. • Rhode Island ranks 38th in the number of poor physical health days and 42nd in the number of poor mental health days.